Monday, Sept. 7, 2009 | It’s early morning, and the hillside above Market Street in southeastern San Diego is alive with noise: planes screaming overhead, 18-wheelers rattling below, trolley cars swishing by. A weed whacker’s whine peels through the warm morning air, high on a ridgeline above Encanto Canyon. Jonathan Basilio and a small crew are meticulously attacking the desiccated weeds that have crept in and now blanket the landscape. Over the cacophonous clatter comes a bird’s call: a gutteral sound, a deep, bassy rattle. It’s a coastal cactus wren, a small, brown bird with a white eyebrow that tucks its nest in thorny cholla cactus. It’s the reason the crew is here, clearing the way to plant thousands of cholla next year. Biologists say few species in San Diego County have been as profoundly impacted by the 2003 and 2007 wildfires as the wren, a bird whose range extends only from northern Baja to southern Orange County. In San Diego, the wren is found in four population centers: Camp Pendleton, San Pasqual Valley, Lake Jennings and around the Sweetwater Reservoir. Three of those burned in the wildfires, destroying the thorny cholla and prickly pear cactus the birds call home. Though biologists don’t have a handle on the exact population, they say the wren’s numbers have dropped since the fires. And there were only an estimated 400 birds countywide in the 1990s. Coastal cactus wrens have carved out an evolutionary niche in the world that’s as precarious as their nests inside the spiny cactus. Unlike desert cactus wrens, they’re picky about their habitat. They don’t migrate. They only live in taller, older plants whose spikes offer the protection the birds need from predators like possums, raccoons and cats. As those plants have burned, wrens have lost their homes and been left with no refuge. Another species is in the same position. The Thorne’s hairstreak butterfly only nests on one type of tree in San Diego: the Tecate cypress. That tree is only found on three mountain peaks countywide, including Otay Mountain, which burned completely in 2003 and then burned again in 2007. Neither species is listed as endangered. Both are predominantly found in San Diego. They’re called habitat specialists. But their specialty is hastening their decline. In San Diego, the effort to understand what’s happening to their populations and stop it is advancing one hill at a time. Hanson is an ecologist and a board member of Groundwork San Diego Chollas Creek, a nonprofit working to restore the urban watershed. He bikes past the hilly site each day on his way to work. With a $240,000 grant from the San Diego Association of Governments, or Sandag, he’s working to prime the land for more wrens, hoping to connect it with another nearby patch of cactus. The site is small (37 acres), isn’t home to many wrens (three pairs) and is in the middle of an urban setting (San Diego). Which makes it almost perfect. Some of largest tracts of the county’s best cactus wren habitat — like the San Diego National Wildlife Refuge east of Chula Vista — have been preserved. Though the land is off limits to development, it isn’t to fire. The refuge burned in the 2007 Harris Fire. Hanson’s site is in the midst of urban life. Ironically, that’s why the wrens are still there. Because it’s so urbanized, it hasn’t burned. Groundwork has hired Basilio and the crew to clear the weeds that have blanketed the site. Weeds don’t foster enough insects for wrens to feed on and they help spread fire. So the crew has been knocking down the dried, brown grasses and hauling them off. They’ll return after the winter rains to douse the next generation of weeds with Roundup. Then Hanson plans to plant 20,000 cholla cactus that students from Millennial Tech Middle are helping to grow, hoping to attract more wrens. Sandag is funding $1.2 million in projects countywide to grow and plant cactus to boost the cactus wren’s population at three other sites. No other single species is receiving as much attention. The wren isn’t the only species that isn’t fully understood. Another mystery flitters through the shrubs that blanket the wilderness on Otay Mountain. As San Diego State biology professor Kathy Williams hikes through the Otay Mountain wilderness, burned Tecate cypress branches snap under her feet. With $30,000 in funding from the federal government (and matching funds from SDSU), Williams has been visiting the mountain, trying to learn about the Thorne’s hairstreak and the Tecate cypress that live there. The Tecate cypress is an evergreen, a bushy tree with reddish bark that can grow to 30 feet. The Thorne’s hairstreak butterfly, a thumbnail-sized insect that flies in jerky bursts, finds something about the cypress’ leaves to be delicious. The two were meant for each other. The cypress needs fire for its cones to open and drop seeds. Too much fire, though, and the young trees don’t have enough time to grow cones. While three-year-old trees have been seen with cones, biologists say a stand of cypress needs decades to produce enough seeds to sustain itself. Otay Mountain has twice been hit hard by fire in the last six years. In 2003, the entire mountain burned over in the Otay Fire. Some biologists feared the Thorne’s hairstreak had gone extinct. The Bureau of Land Management, the federal agency that owns the land and funds Williams’ research, estimated that the mountain was covered with 5,100 acres of mature Tecate cypress before the fire. Afterward, about 90 acres of older trees remained. Two-thirds of those remaining mature trees burned in 2007. Since those fires moved through, cypress have popped back. Many young trees are chest high. But the dry, brittle weedy grasses that sprout annually and help spread fire are back, too, and they blanket the ground, ready to fuel another blaze. Biologists fear that another fire would decimate the tree population — and the butterflies with it — before enough seeds are ready. “If this burned again, there is potential for those trees to go extinct in a short period of time,” says Joyce Schlacter, a BLM wildlife biologist. While Williams has worked to understand the butterfly’s habits and peculiarities, she has made her own discoveries. The butterfly hasn’t always been well understood. For example, conventional wisdom held that Thorne’s only fed on older cypress. But Williams has found Thorne’s caterpillars feeding on young trees. That’s vital for our understanding of the butterfly. It means the population has more food than biologists previously thought. As Williams talks about the butterfly, she starts thinking through all the unanswered questions she still has about its biology. How do they colonize new areas? Where does each seasonal hatching of butterflies fly off to? “They still have a lot of stories to tell us,” she says. Matt Forister, a University of Nevado-Reno biology professor, is also working to answer some of those questions. He and his graduate students are mapping Otay Mountain’s cypress and Thorne’s populations. Sandag is funding the $153,000 effort. 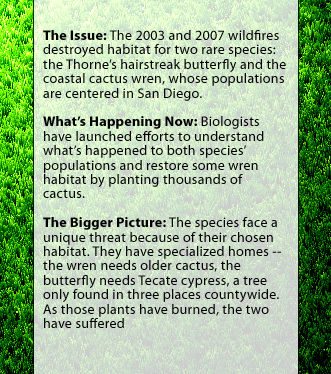 While the Thorne’s may have suffered from the fires, it isn’t listed as an endangered species. (Nor is the wren.) The U.S. Fish and Wildlife Service, the federal agency that regulates the Endangered Species Act, has rejected two petitions to list the butterfly — a step that would potentially require more funding to be spent on the insect. It rejected a petition to list the wren in 1994. The service cited a lack of information about the butterfly’s population size in its latest rejection, saying it was impossible to determine the impact of fire on the population without it. That rejection came before the 2007 fire hit the mountain. The Center for Biological Diversity, an environmental group, has since sued the federal agency to list Thorne’s. David Hogan, a local environmental activist who filed both requests to list the butterfly as endangered, says numerous steps could be taken to safeguard the species: stationing more firefighters near Otay Mountain, raising butterflies in captivity or planting more Tecate cypress. “It could be any number of things that involve intervention by people and funding to do those things to bring the species back from the brink,” Hogan said. That type of human intervention — like the weed removal and cactus planting for the wren — is becoming more common. Forister expects it will continue.